The Board affirmed a refusal to register the design shown below, for "Non-medicated cleaning preparations for livestock, horses, and domestic animals, ...." and various other products for said animals, agreeing with Examining Attorney Barbara A. Gaynor that the design fails to function as a trademark. Said the Board: "Applicant’s applied-for design fails to emerge out of the background of the specimens and hit the prospective buyer in the eye, and [we] find that Applicant’s ribbon-shaped banner is a background design that does not create a commercial impression separate and apart from the word mark in conjunction with which it is used." In re W.F. Young, Inc., Serial No. 86454618 (February 14, 2018) [not precedential] (Opinion by Judge Albert Zervas). The Examining Attorney maintained that the applied-for mark "is merely a background design that functions as part of a composite mark that incorporates additional designs or wording." (see excerpt from specimen of use, below). The Board observed that when an applicant seeks to register a background design, the design must create a commercial impression separate and apart from the word mark with which it is used. Professor McCarthy has commented that "the more fanciful and distinctive the background design, the more likely it is to 'hit the buyer in the eye' and hence be more than background. In such a case, the so-called 'background' comes out into the spotlight of real trademark significance." The Board noted that none of the specimens of use showed the ribbon-shaped banner alone; all have the word ABSORBINE superimposed thereon. 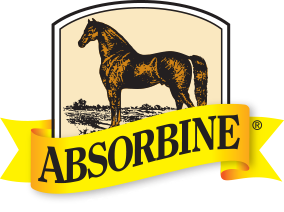 The word ABSORBINE covers much of the design and follows the incline of the banner. This arrangement of wording and geometry suggests that they are part of the same mark. The color yellow is irrelevant since color is not claimed as part of the mark. Ribbon-shaped designs are not uncommon for these type of goods, as evidenced by the two registrations cited by the Examining Attorney. The applied-for design appears to be nothing more than a refinement of a basic background design and would be regarded as such by consumers. And so the Board affirmed the refusal under Sections 1, 2, and 45 of the Lanham Act. TTABlog comment: Even if applicant had claimed the color yellow, I doubt that it would have made any difference. No look-for advertising, no use of the banner with words other than ABSORBINE. Is this a WYHA? Either a very inexperienced attorney, or a client who simply wouldn't take 'no' for an answer. Not a WYHA, it's a WYHF (would you have filed)? Agree on the WYHF. What was the purpose of this application in the first place? Unless they had a specific use they wanted to target in mind, I don't see any value in this application.